Some celebrities do their thing, have their day and then quietly disappear. 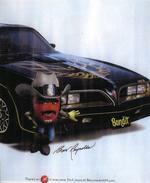 Not Burt Reynolds. After his Deliverance and Smokey and the Bandit days, there were his Boogie Nights days. Over 150 movie and TV appearances since he began his career. Now, perhaps tired of acting for ego-maniacal, self-centered, Hollywood directors, Burt turned to ego-maniacal, self-centered, New York advertising agencies popping up in FedX ads, DirecTV ads, Miller Lite ads, Kodak ads, T-Mobile ads and now M&M's BecomeAnMM campaign spotted by Copyranter in the March issue of InStyle. Surely Depends is next. Poor Burt! 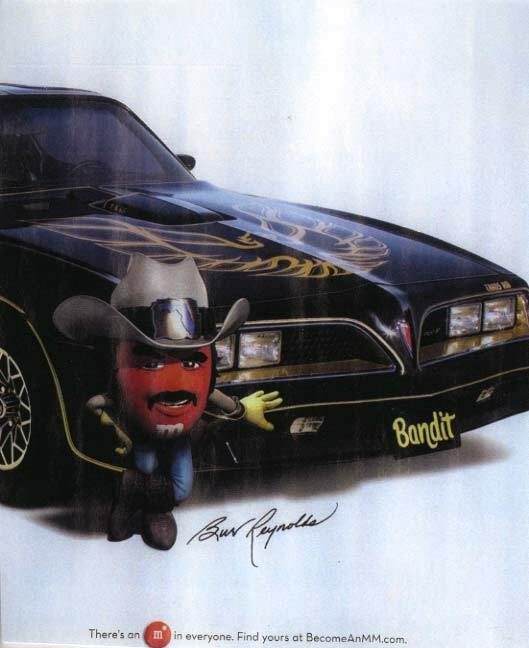 This year is 30 years since Smokey and the Bandit-and M&M is sponsoring a car show and these cars are a part of it and so is Burt. I hope when I am old and grey some people still show me some respect and dosen't sugggest I do a depends commercial.